In his media statement released today, Senator the Hon Simon Birmingham, Minister for Education and Training announced the $333.5 million of funding as part of the Australian Research Council’s (ARC) National Competitive Grants Programme. It states that protecting the environment, medical advances, initiatives to support small business and creating employment opportunities for Australians are central to 859 new research projects the Turnbull Government is backing. Congratulations to members of the Bio21 community whose research has received funding and who have been part of LIEF infrastructure and equipment grants that have received funding. Congratulations to Elizabeth Hinde, Craig Hutton, Uta Wille, Malcolm McConville, Stuart Ralph, Diana Stojanovski, Richard O’Hair, Paul Donnelly, Justine Mintern, Spencer Williams, Kat Holt on their successful ARC Discovery grants. The funds will support diverse projects, from simplifying methods of synthesizing small molecules; seeking to understand the nuclear architecture of cells; to improving nanoparticle design for vaccine delivery (see below). Congratulations to Lloyd Hollenberg, Paul Donnelly, Leann Tilley and Paul McMillan on cooperating on successful ARC LIEF grants, that will go towards establishing a cryogenic, quantum microscope facility and an adaptive optics, super-resolution optical microscopy facility, respectively. 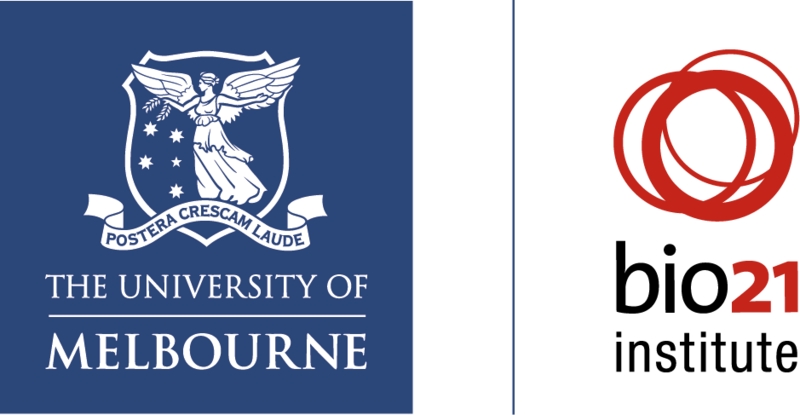 The University of Melbourne received a total of $29, 610, 922 in funding. Discovery and LIEF grants that include Bio21 members (including collaborations with Monash University) totalled $4,620,876. Below is the list of Discovery and LIEF grants announced today for members of the Bio21 Community. This project aims to investigate the role of nuclear architecture in regulating genome function by development of a new microscopy method to quantify the diffusive route of fluorescent proteins in live cells. The anticipated outcomes of this project include an insight into how chromatin dynamics facilitate DNA target search and an analytical tool for cell biologists to probe how genomes work in their natural environment (the cell nucleus). This project received $412,608 over 3 years. This project aims to invent new synthetic strategies that enable chemical manipulation of small cyclic peptides, a promising class of biologically active molecules with high metabolic stability. Combining theory and practice, this project will develop novel acyl transfer reactions that will allow traceless, site-selective, ring expansion and contraction of small cyclic peptides. This project will result in new synthetic methodology that will simplify the synthesis of an important class of small drug-like molecules. This will provide significant benefits, such as a breakthrough in the synthetic approach to small cyclic peptides, which will strengthen Australia’s international standing in peptide research and provide new strategies for translation to the growing biotechnology industry. This project received $396,610 over three years. This project aims to investigate the origin and function of the large number of chemically undefined metabolites that occur in all cells. The project will utilise advanced analytical techniques, as well as computational and genetic approaches, to characterise the chemical structures of these metabolites and identity the enzymes involved in their synthesis and degradation. It will provide new information on the metabolic capacity of eukaryotic cells and allow the generation of more accurate models of metabolism. These outcomes have important biotechnology applications and will identify metabolic processes that underpin normal and disease states in animals and human cells. The University of Melbourne. This project received $530,496 over 3 years. This project aims to understand how intracellular bacterial pathogens target mitochondria. Coxiella burnetii is a unique and significant pathogen of humans and commercially important animals that uses effector proteins to control host cell functions. A cohort of these effectors target mitochondria. Since mitochondria are key players in cell health, the intended outcome of this research is to understand the role of the mitochondrially-targeted effector proteins. The project will determine the importance of mitochondrial protein trafficking for Coxiella pathogenesis and how mitochondrial function is altered during infection. This will provide understanding of how bacterial pathogens manipulate organelles like mitochondria for their survival. This project received $269,734 over 3 years. This project aims to discover new metal-promoted methods to synthesise amides and thioamides, important structural motifs in chemistry and biology. The project will use a mechanism-based approach that integrates theory with gas- and solution-phase experiments to discover new chemical reactions. A benefit of this research will be new eco-friendly alternatives to existing processes, thereby reducing waste and eliminating toxic and expensive reagents. This project received $401,706 over 3 years. This project aims to engineer responsive nanoparticles capable of trafficking efficiently within cells. The site of release of therapeutic cargo has importance for improving the efficacy of many treatments, for example vaccine delivery. Therefore fundamental understanding of how nanoparticle structure can be engineered to control cellular behaviour is necessary. The project will engineer new polymeric nanomaterials and investigate the impact of their structure on biological properties. The benefits of this project will include new fundamental insights into improving nanoparticle design for vaccine delivery, as well as the expansion of Australia’s knowledge base in the area of biodegradable polymers. This project received $438,161 over 3 years. This project aims to develop a detailed molecular description of the sulfoglycolysis pathway, a major pathway involved in cycling an abundant sulfolipid. The project will use an integrated chemical, biochemical and structural approach to illuminate how sulfoglycolysis degrades sulfolipid to access its elemental and energy constituents. Expected outcomes include an advanced understanding of the biosulfur cycle, the development of new chemical approaches to manipulate sulfur cycling for agricultural and biotechnology applications, and deepened ties to leading international researchers. Potential benefits include new strategies to reduce dependence on agricultural fertilisers, promote gut wellbeing, and control insect pests. This project received $496,925 over 3 years. This project aims to investigate how the complex cell walls of Mycobacteria and Corynebacteria are assembled. The project will utilise a combination of genetic, biochemical and advanced analytical approaches to investigate individual steps in the synthesis of key cell wall components and understand how the assembly of these components is coordinated with bacterial growth. Important outcomes of this research will be detailed information on processes that regulate the growth of bacteria with important biotechnology, veterinary and medical significance, as well as information on mechanisms of cell wall synthesis that may be conserved in all bacteria. This project received $707,328 over 3 years. This project aims to measure the rates and genetic mechanisms of adaptation for individual species within a microbial community. Expected outcomes of this interdisciplinary project include the first genomic and phenotypic dataset of a model microbial community, and novel tools for the analysis of meta-genomic datasets. This project has the potential to transform understanding of microbial adaptation. This project received $398,794 over 3 years. This project aims to establish a cryogenic, quantum microscope facility in Australia. Quantum sensing is a new field that harnesses the properties of individual quantum systems to realise new types of detection and imaging with unprecedented combination of sensitivity and spatial resolution. The potential innovations, applications and benefits to society are far reaching across the full spectrum of scientific and engineering activity, from the development of atomic-scale imaging of protein structures for drug discovery, to the study of chemical, physical, and biological processes and materials for advanced technology and manufacturing. This application received $223,039. This project aims to establish an adaptive optics, super-resolution optical microscopy facility to image cellular events with the highest possible spatial resolution, in a whole cell or tissue context. Sophisticated computer-controlled deformable mirrors will be used to correct the way light is distorted as it passes through specimens, thereby overcoming aberrations found in thick and complex samples. This adaptive optics system will enable researchers to study complex behaviour of biological specimens, at the optical resolution limit in plant and animal tissues, leading to basic biology and biotechnology outcomes in biofuels, biomaterials and biomedicines. This application received $345,475.